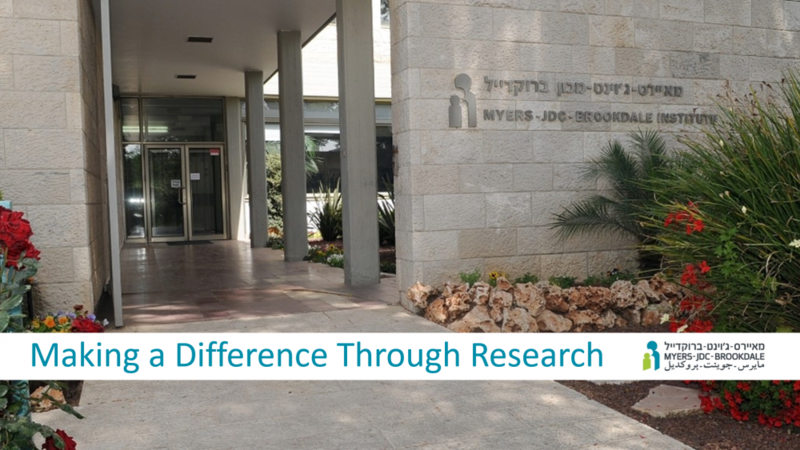 The Myers-JDC-Brookdale Institute is Israel’s leading center for applied research on social policy and human services, serving Israel, the Jewish world, and the international community. Our mission is to increase the effectiveness with which society addresses critical challenges to enhance the well-being of Israel’s citizens, and expand opportunities for its most vulnerable members. The Institute was established in 1974 as an independent, non-profit partnership between the American Jewish Joint Distribution Committee and the Government of Israel, with the David and Inez Myers Foundation of Cleveland entering into the partnership in 2004. Our founding 44 years ago was a milestone in the efforts to promote the use of research to improve the effectiveness of Israel’s social service system. Today, thanks in no small part to MJB, research, evaluation, and ongoing learning are now ingrained in much of Israel’s social policy and program development. MJB’s research makes a difference across the entire life cycle from children and youth at risk to the elderly, in every important dimension of life—education, employment, disabilities, health, immigration, and social welfare. Internationally, our knowledge and expertise are increasingly sought after by Jewish organizations around the world, international organizations, philanthropic foundations, and others.